What’s the exact name of this bump? The correct answer is C, the incisive papilla. Dog owners may casually stumble upon a dog’s incisive papilla one day when their dog is lying down belly up with his mouth open. From this angle, the incisive papilla, which is located at the top of the roof of the dog’s mouth, may become easily visible. To be exact, in a normal, healthy dog, the incisive papilla is located right behind the dog’s top two middle teeth. The bump may feel hard to touch and some describe it as vaguely resembling a little diamond in shape. Because a picture is worth 100 words, seeing it is far better than describing it in words, so on the left you can see a picture of it along with the dog’s palateal rugae. What’s the purpose of this little bump on the roof of the dog’s mouth? Mother Nature hasn’t placed it there just because. 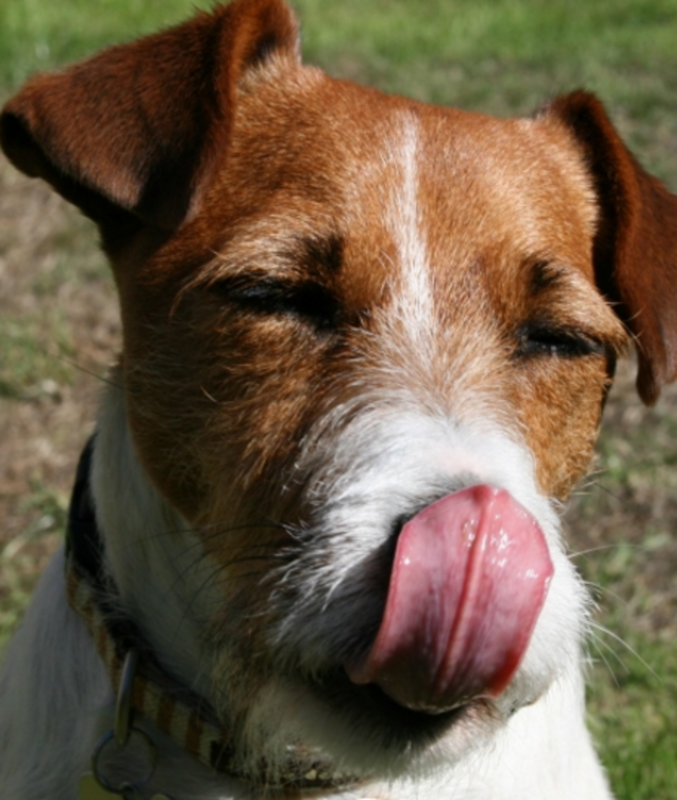 The incisive papilla actually has something to do with a dog’s sense of smell. Within this small bump there is a small duct which connects the dog’s nose with his mouth. Basically, it turns out that the dog’s incisive papilla is able to communicate with the vomeronasal organ, a special organ meant for detecting pheromones, substances left behind by certain animals for communicative purposes and that have an impact on the animal on the receiving end. In a similar fashion, dogs have their own way to analyze pheromones. According to the book “Behavior Problems of the Dog and Cat” by Gary M. Landsberg, Wayne L. Hunthausen and Lowell J. Ackerman, by panting and flicking their tongue against the incisive papilla dogs are better able to detect pheromones. The tongue flicks can also be accompanied by teeth chattering and foaming at the mouth. Once the information (at a molecular level) reaches the dog’s brain (the amygdala to be precise), it can trigger an emotional or physiological response. Normally, the incisive papilla quietly sits there without creating any problems, but there may be times where things can become slightly problematic. In the case of a malocclusion, where the dog’s teeth do not do not align correctly, the lower teeth may end up hitting the roof of the dog’s mouth. According to Animal Dentistry and Oral Surgery Specialists LLC, this may cause the incisive papilla to swell. It’s always good practice to get used to the normal appearance of the dog’s mouth so that dog owners can promptly report to their vet any odd looking lumps or bumps in the dog’s mouth.